Julia Schneider and Sarah Dodge are women to know in the food world of ATL. I’m obsessed with the South. Always have been. Always will be. Back in the day, I almost moved to Mobile, Alabama (for a relationship of course but thank goodness I came to my senses, to be honest). Before I made the decision to move to Austin, I juggled between the idea of living in Austin versus Nashville. I didn’t know it at the time but the South had been calling my name for a long time. On a whim last year, I bought a ridiculously cheap flight to Atlanta for a random weekend in February, knowing damn well that I had absolutely no connections or friends out there. But now I’ve made some of the best friends one could have. The Atlanta community took me in during that weekend, opening its arms to a stranger in their midst. When I first arrived, I walked around the Old Fourth Ward drinking coffee, standing in line at Staplehouse all while determined to eat at Bon Appétit’s Best New Restaurant of 2016. I sat at their bar and had dinner by myself, chatting up the bartenders, who then sent me to Ticonderga Club down the way. On a busy Friday night, I wriggled my way into a seat at their bar, chatted with bartenders and patrons alike, and immersed myself in this enthralling scene of real Southern hospitality. This was just the first night, y’all. I went back to T-Club the next night, to chat it up with Sarah Dodge and Julia Schneider (thanks for the intro, Hilary!) In the midst of Super Bowl Sunday madness, we chatted about the industry, why we love food, and Atlanta’s supportive community, all while eating deep fried pickles and foot-long hot dogs. I was totally enamored by these two and how they found their way into food and beverage. Sarah went to school for psychology, working as a nanny and pre-school teacher, before making her way to grad school. In the midst of her program, she decided to take up a baker job and realized that she found more fulfillment in the industry rather than school. So, she dropped out and took baking to the next level. She’ll be the first to tell you that she didn’t know a thing about baking when she started out but after spending time at local staples, Holeman and Finch and Little Tart, she eventually made her way into the arms of Julia. The two met while Julia was working as the kitchen coordinator of Octane Coffee and have been friends and collaborators ever since. And then, there’s Myrna Perez of LottaFrutta. I was introduced to Myrna on that fateful Super Bowl Sunday night, by Sarah. Her energy and vigor upon meeting had me hooked and I begged for her time before leaving the next day. “We’re closed on Mondays, mama,” she regretfully responded. I must have had such a look of heartbreak, because she changed her mind right away. My last day in the A was spent eating my way through the LottaFrutta menu, chatting about our shared love of South Texas (hey Valley Girls! ), and the love of family that brought about Perez’s LottaFrutta into the Old Fourth Ward. First off, what are the odds of finding someone else in Atlanta that’s from the same part of Texas?! Seriously. Myrna grew up in McAllen while my formative years were spent in nearby Brownsville. Her Mexican-American upbringing means a lotand you can tell as soon as you walk into LottaFrutta - it’s an homage to her roots. Her grandfather, a fruit chef, was known as “El Frutero”, who would carve intricate sculptures out of fruits. The leftovers would go to her grandmother, who would turn them into paletas (homemade popsicles) and she’d sell them to the kids in the neighborhood. It was what was the most familiar to her and what she didn’t know she needed when she moved to Atlanta in 2004. LottaFrutta was Perez’s first website project in art school and she never thought it’d turn out to be what it is today. After eleven years at Univision (which took her from Dallas to Atlanta), she bought the building that’s in the Old Fourth Ward today. As soon as you step foot into the space, it’s as welcoming as any other fruiteria from the Valley. The colors are bright, the fruit paintings on the wall are all done by Myrna herself, and the air of the place is beyond welcoming. 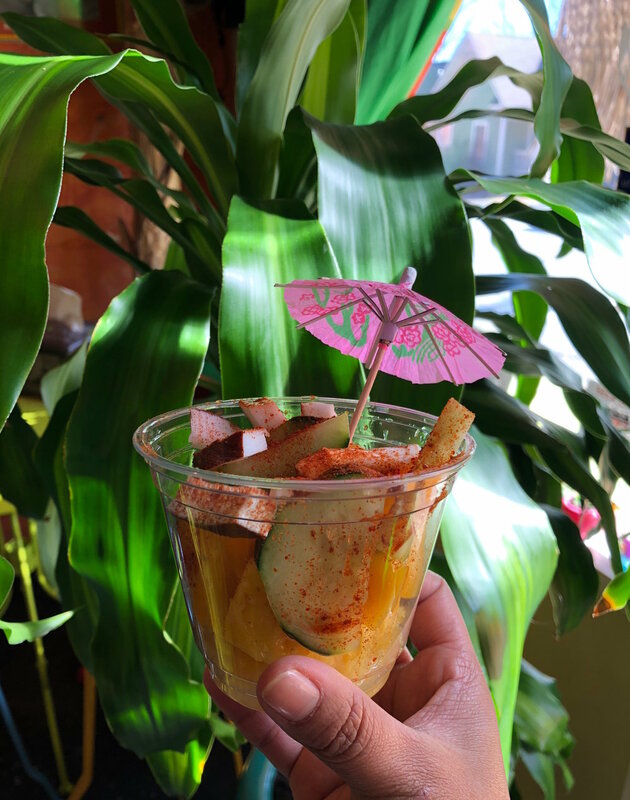 Old family photos are displayed to pay homage to her upbringing, Mexican candies that I hadn’t seen since leaving Brownsville are on display, and a plethora of fruit cups and Latino delicacies are up for grabs. Pair all of this with her captivating presence and you’ll understand why LottaFrutta is a staple for the food scene in Atlanta. It was one of the best weekends I’ve had to date and I couldn’t stop thinking about it. “We should go to Atlanta and do a pop-up dinner there. 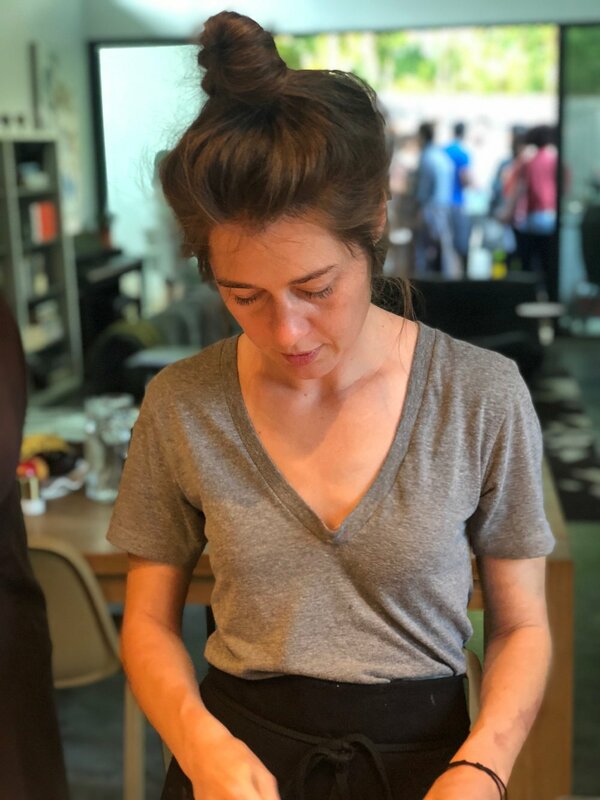 I’ve met some pretty amazing women in the food community and we just have to go back.” That was my opening line when I called my good friend Yana Gilbuena up, as soon as I got back from my trip. I spent the next two hours detailing my brief weekend in the city and its impact it had on me. By the end of the conversation, we were determined to get to the A. 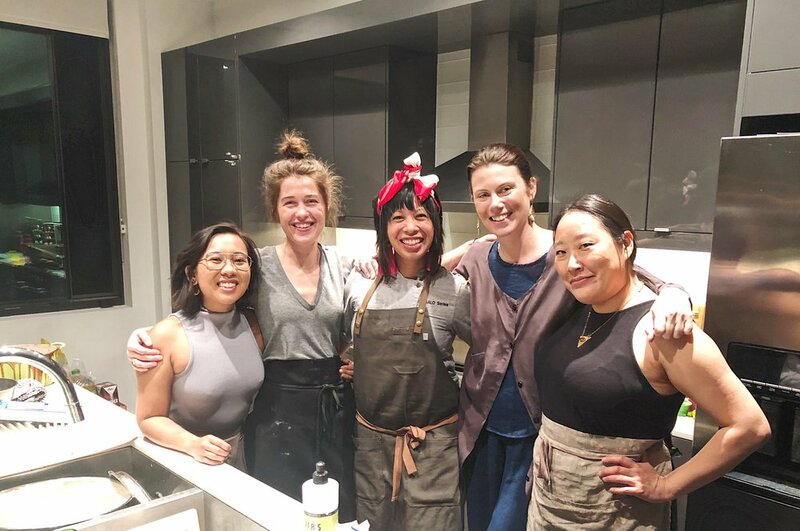 We hosted two wonderful pop-up dinners, made all the friends, collaborated with Sarah and Julia, and cemented roots in the scene that has since captivated my heart. Atlanta’s diverse community is strikingly supportive and I wouldn’t have been able to make the connections and friends I have now, had it not been for its people. Thanks to everyone that helped us out back in April. I think of y’all fondly and hope to make my way back to the A soon. Katy Milam moved to Marfa from Los Angeles earlier this year. On a whim, she visited for three days after her good friend, Tatanka Guerrero, asked her to. He offered her a position as chef at Al Campo - the newest restaurant in town. The rest is history. Katy spent the last 15 years in Los Angeles, working at a company that wasn’t challenging or creative enough. “My soul was dying,” she recalls as talked about her job search - she eventually responded to an ad from a production company that needed help executing workshops. When she interviewed, they admitted that they needed someone that could also cook. Within weeks, it turned into only cooking. It spiraled from there - she started doing catering gigs, productions, doing popups, and everything in between. She comes from a long line of Cajuns from New Orleans, so it's no wonder that Katy felt at ease in the kitchen. Most of what she’s known in the kitchen, she learned from her mother and grandmother. The slower pace in Marfa has seeped into her routine, like it does for everyone thats moved there. She enjoys spending her time in the kitchen, perfecting her smoked chicken taco recipe and looking out the window as someone takes their first bite of food. As for Tatanka, he’s been in the industry for a bit. He worked the bar scene in Miami, to opened new concepts in Las Vegas, and after an epiphany with his business partner, he found himself in Marfa, enamored by the small town charm and ability to attract expats from all over the world to the remote Texas desert. He spent the first three months in Marfa taking it in before breaking ground on the project. The idea of building out their hotel brand, Hotel Bohemio, was perfect for the environment. “The journey that we are on right now is to become part of the community and to build culture,” he explains. You can tell that the man has put forth so much time and effort into the concept, making the Al Campo space as comfortable as possible. “You build a little bit of that passion every day here,” Tatanka stresses when he talks about the dedication and hard work that his small team has brought. These two are prime examples of what you’ll find in Marfa - individuals dedicated to the pursuit of happiness, in the middle of the desert. Marfa’s a carefree place, there’s no such thing as traffic jams, and people have to constantly remind you to slow it down when you’re out there. The community is supportive of endeavors such as Al Campo and open to tourists and weekend warriors alike. It’s really a magical oasis smack dab in the midst of West Texas, full of art, creatives, warm greetings, and quirky townspeople. Roberto Ainslie hadn’t planned to land in food & beverage. Way back when, “Ro” as he’d rather be called, was in his first semester of graduate school for counseling while doing some art consulting on the side. He met Scott Walker and Chef David Bull of now defunct fine dining establishment, Congress, by way of his childhood friend and chef, Rebecca Meeker. Starting as a server assistant at Second Bar + Kitchen, he eventually worked his way up to managing Congress. After juggling a year and a half of grad school and managing, he was offered a job in New York. A stint at an advertising agency as their events manager then led to Michelin-star Betony in Midtown Manhattan. Though Betony has since closed, Ro lovingly talks about the in’s and out’s of fine dining that he learned at his time there. “Restaurants in New York are super, super intense. I was working here, without exaggeration, eighty-five plus hours a week. Everything we did expanded.” New York can take a lot of you, folks. You don’t have to live there to know that the lifestyle, especially for those that work in the service industry, can be tirelessly draining. But when you hear Ro compare a napkin fold be as important as the garnish of a dish is, you can tell that the man really cares about his work. Eventually, he made his way back to Austin in 2014, working at some wonderful Austin restaurants: Jeffrey’s, opening Gardner, Boiler Nine, and now landing at Olamaie. I had the opportunity to witness Ro at work at this James Beard award-winning restaurant, during pre-shift. So, here’s the thing about pre-shift in restaurants. You know how before the big game, the team and coach get together to go over their game plan? This is the equivalent for the restaurant industry (sorry I tried to throw a sports reference in there when I know hardly anything about sports but I’m sure you feel me). Back in the day, when I worked in restaurant kitchens in Vegas, I’d try and eavesdrop on pre-shift talk from the front of the house managers and servers, because I was always intrigued by this daily ritual before service. While I watched Ro in the midst of pre-shift, his staff so attentive, Chef Michael Fojtasek also at the helm of this meeting, it was all overwhelmingly inspiring. They went through the motions, what was available on the menu, new ingredients and rotating wines on their menu, and answered each other’s questions. Literally, you could have picked my jaw up off the floor because this is it, y’all! This is Southern fine dining at its best in Austin, Texas. Locals love to gloat on how casual it is here and that we aren’t stuffy like them Yankees up in New York or those Californians in San Francisco but if you aren’t looking too closely, you may just miss a fine dining experience that is offered by some of the most dedicated professionals in the food & beverage industry. They ended their pre-shift with a word of the day, as Ro asked one of the sous chefs for a suggestion. “How about ‘welcome’? Since we have a new team member, I’m back in town, and it just seems appropriate.” On the count of three, the whole team shouted “Welcome!” in unison and broke for what I’m sure was a wonderful dinner service. Thanks Ro, and thanks to the team at Olamaie, for making it known that there are some amazingly dedicated folks in our industry. The industry runs in the family, Ashely Cheng fully admits. The family landed in Austin in the seventies, with the help of her great uncle, a former math professor at Huston-Tillotson University, sponsoring their move. Looking back on it now, Ashley beams at the closeness of proximity between the SPUN Ice Cream flagship store and Huston-Tillotson in East Austin. Her father owns Chinatown in the Bee Caves area (where she and her siblings learned the ways of industry, hands on) and her aunt owns Freda’s, a Cajun-influenced North Austin restaurant. She and her sister Christina, focused on degrees that weren’t based in the industry (Ashley went to Boston University and Christina went to UT after a stint at the University of Chicago). After a few years in journalism, Christina decided to get back in the family business and earned her pastry certificate from Le Cordon Bleu. With the help of their cousin, Christopher, they opened SPUN in 2015. The trio manage the ice cream shop, with their focus on liquid nitrogen ice cream. “It’s not just a gimmick, it has a different texture. The ingredients are really fresh”, she says. Their focus of local and fresh ingredients and made from scratch mentality sets SPUN apart from other shops. Along with their flagship store on the East Side, they just opened their second location at the Domain along with their ice cream truck. “There’s so much room for creativity in the ice cream world. We focus on nostalgic, childhood flavors we grew up on”, Ashley points out. Not only does SPUN make it fun to play with your food, they tug at your heart strings with childhood flavor combos made for grown palettes. Summer’s arrived in Austin and what better way is there to kick off the season than with a Filipino pop-up dinner?! A couple weeks ago, Yana Gilbuena of SALO Series came back to town and we threw INIT: A Filpino Summer Feast. This menu was an homage to our culture’s hot weather food full of whole fish, pickled vegetables, and plenty of that bright, green rice she’s known for! Nestled in the heart of East Austin, the five acres of Boggy Creek Farm represent one of the most veteran urban farms in the whole country, let alone in Austin. The house on the lot was built in 1840 along with its sister house, The French Legation Museum, which is close by. Both houses were built in 1841 and Carolann stresses the fact that they have to not only take care of their five acres of farmland but also the house itself. Carol Ann Sayle and Larry Butler started their original farm in 1991, about 80 miles away in the Oak Hill area. At the time, Carolann had an art studio right next to Larry's television store. Their landlord introduced the two, they formed a friendship, and found themselves combining their families. Larry's family grew up on 40 acres of farmland in the area, so he knew a thing or two about farming before Boggy Creek. They always loved East Austin and found themselves buying their East Austin land in 1992 so they could farm in town. The grand greenhouse contains the seeds that end up being planted in the field, as Carol Ann stresses that everything on the farm is started at seed right there. From tomatoes and cauliflower to Romanesco and everything in between, all of the produce is lovingly cared for by the Sayle/Butler Family and their small team. Since there weren’t any farm stands in the area, they started their own on their property in 1994, with just one table of produce until the word spread. Nowadays, Boggy Creek Farm stand has expanded from that first table to a larger spot next to the house. Boggy Creek’s weekly produce is represented, along with goods from other local purveyors like Pure Luck Farm, Bee Tree Farm, Dos Lunas and Thunder Heart Bison. Also on the shelves are Larry’s Original Smoked Dried Tomatoes and Hot Sauce, both delicious snacks from the man himself. The farm stand is open from Wednesday to Saturday from 8 a.m. to 1 p.m.
“It’s a cheesy love story, through and through”, Kendall Antonelli says when she talks about the labor of love that is Antonelli’s Cheese Shop. The two met in college, at Georgetown, and have been inseparable ever since. Kendall, hailing from North Texas, and John, coming from just outside of New York City, decided to move to Austin after college and get married. At the time, John was a CPA while Kendall worked for a local nonprofit in town. During their honeymoon, John turned around to Kendall and expressed his interest in the cheese business. They had no clue what was in store for them in that world but they decided that after the honeymoon, they’d pursue their dream. Two years later, the duo opened their doors to Antonelli’s Cheese Shop in Austin’s Hyde Park Neighborhood. At first, the duo started out with themselves along with one other employee and have now expanded to 18 employees and plenty of regulars. Both their cheese shop and house have plenty of smiling faces willing able to help customers out in their selection of cheeses. They do practically everything: from working in wholesale with local restaurants and chefs, to their cheese of the month club, e-commerce, and events. At any given moment, there are about 75-100 cheeses in their store with an additional 100 cheeses at the cheese house, for local suppliers. Antonelli’s are proud members of the local Slow Food Austin chapter along with the Good Food Retailers Collaborative, supporting small businesses and entrepreneurs. Though the cheese world can be very overwhelming, they break it down in seven different categories: fresh, bloomy/soft rind, washed rind, semi-soft, firm, hard, and blue. Feel free to walk into the cheese shop at any given moment and ask their friendly cheesemongers for a Cheese 101 Tutorial, they’re always happy to walk you through ‘em! Though they’re often asked whether they make their own cheeses, they do not, but Kendall’s response is, “We don’t craft cheese, we craft stories.” Their story is one made with an abundance of passion and love, between each other and for what they do.